With the Salvia now having taken over most of the garden, bees have descended upon those nodding flowers by the hundreds if not thousands. After a few days under this wonderful siege, we left them alone. The buzzing noise and hyper activity made Milo the Jack Russell nervous. 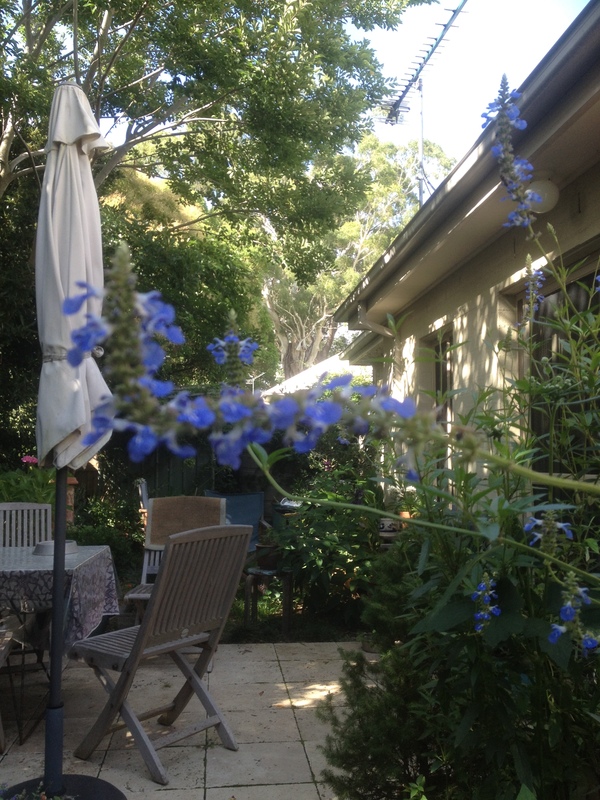 Hanging the washing outside carried an increased risk of getting stung by an over- excited bee if not covered in salvia pollen as well…Some of the Salvia beads of flowers had multiple numbers of bees scrambling for a place inside the flowers. There were disagreements between them, and despite some of the older more wiser bees trying to mediate, try and keep peace, there was nothing much we as mere humans could do except pack a couple of bags, some wooden sandals with water, also bread and some mild salami to seek temporary salvation ourselves. It could well be that salvia’s potent hallucinatory substance affects bees in a hostile way. The science is still out on that one. In America there are a few states that have put Salvia on the list of forbidden plants and anyone caught with it could be charged with drug offence. Beware when travelling in the US of using mint in your soup! In any case, we could not pontificate forever about what bees might or might not be capable off. We drove somewhat in an uncertain fashion but generally following the orange sun in a east-south-westerly direction and just before dusk managed to get into a place that had a bed with soft pillows but a firm mattress. The building had seen better more jovial times but the host was buxom and justifiably friendly as is often the case with soft fronted women, especially if they have names such as Maria, Barbara, Josephine and Virginia, (but not so much if Gertrude, Kate or a Mavis). We asked for a later than usual breakfast and explained about our reason for departure from our home due to bees being temporarily frenzied by sweet Salvia and pollen. She understood and told us the story how her parents had to sell their grand mansion in Chili’s Valparaiso and move when their garden became a rehabilitation unit not only for the politically driven mad, infirm and the marital unstable but also for Salvia addicted bees. Her mother found it easier to counsel the infirm and mad than a frenzied bee. They left for shores named Australia. We were lucky to have found this place as week-ends are usually booked out in advance. They had a cancellation from a couple who were needed for a fund raising to buy a property taken over by bees as well. We were somewhat alarmed and uneasy by this notion. Our next door room was taken by a rather corpulant couple. They seemed to be in a cheerful mood and each time we met in the corridoor they laughed heartily at almost everything we spoke to them. It was infectious and I found myself soon laughing spontaneously as well. The bed and breakfast was guarded by a couple of mastiffs who just gave us a somewhat desultory sniff between our feet to let us pass each time we came home from our walks in a nearby dense forest of tall eucalypts and she oaks. The bees were in profusion here as well but on the whole friendly and non-intrusive. Of course we stayed away from the hives that some of the town’s folk had put there to possibly supplement meagre incomes and keep some errant male retirees busy and off the streets. We noticed an elderly deeply wrinkled man without any protective gear shaking the honey from the cone panels in a hand driven centrifuge. All he did to calm the bees was smoke a pipe and with gentle breaths pacified the busy bees. They obviously knew him and his particular brand of pipe tobacco. We stayed for three nights and with some sadness said goodbye to our kind host and drove back home. We were pleased to be back, rejuvenated and with some jars of honey as well. 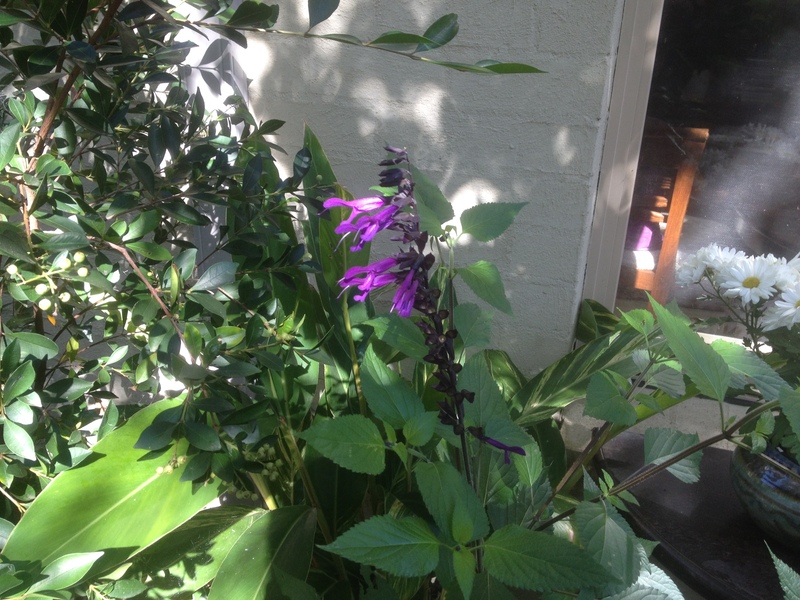 The Salvia bees had gone and all was as before, peaceful and sweet. While I’m just making sure the comment function works, I enjoyed reading this. That man knew his bees, and vice-versa.